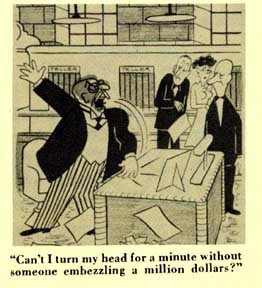 We were perusing the October, 1946 issue of Liberty Magazine when we noted that some of the cartoons were strangely relevant to October, 2002. See for yourself! It looks like Enron, WorldCom, and Martha Stewart would have been recognizable in 1946. 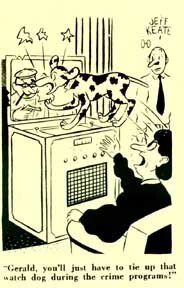 Variations on this gag were printed in college humor magazines practically every week through the 1960s. This may be the source -- I have seen nothing earlier. 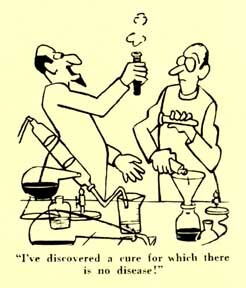 Those with 401-K investments in the Pharmaceutical sector may find a strange resonance with this gag. 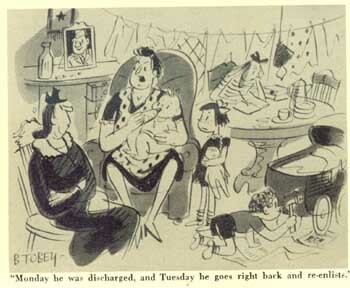 Instability in the Nuclear Family was becoming quite a problem in 1946. 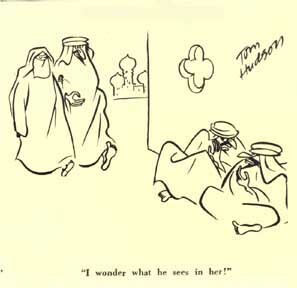 This gag apparently sympathizes with the vanished father, with possibly some shred of justification --- from whence came the nursing infant? Had Mom been "sitting" under the apple tree before GI Joe came marching home? It could very well be: The Best Years, discussed in our Books Section, is possibly the most complete source on 1946 popular culture. The chapter on "Family Dynamics" reports that nearly 95,000 divorces were granted, dissolving marriages in which servicemen returned to find nursing infants that they could not have fathered. Remarkably, it was estimated that nearly twice that number elected to remain in their marriage. This cartoon is absolutely NOT relevant to 2002. 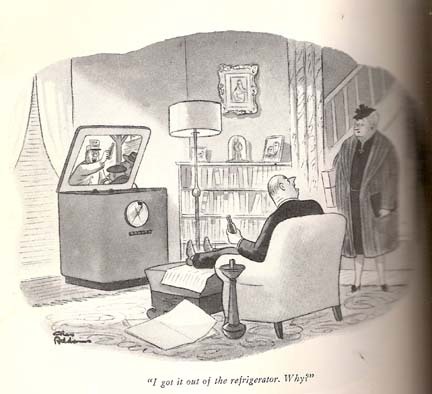 It is very interesting to me, because it is the only instance that I have found in which an early projection TV is represented. 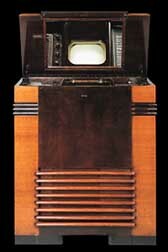 The 12" mirror-in-lid TRK-12 was RCA's first television to be sold to the public. Priced at $600.00 ($18,000 today...), it was RCA's most expensive yet most popular pre-war model. The pictures were viewed indirectly by reflection in a mirror built into the cabinet lid. The length of picture tubes (Kinescopes) available at the time necessitated the mirror-in-lid design. Vertical orientation of the tube minimized the protrusion of television cabinets out from the living room wall, and the mirror lid could be closed, enabling the television and radio to be hidden when not in use. 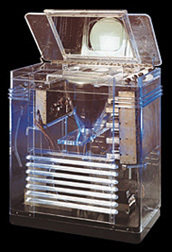 The Lucite "See Through" model was made for the 1939 World's Fair and was very popular among fair-goers. I have shown this to a few people and they don't get the gag at all, so here goes. First, the only things that were shown on early TV were sporting events (like baseball games). Second, in the old days, you could actually buy a bottle of beer at the ballpark. Third, the cameramen in the early days took pictures of the crowd -- it was a big thing to have said thaqt you "had been on TV" and viewers were VERY interested to see their relatives on TV. Fourth, the exact nature of TV was unknown to most people, and it was common to believe that almost anything could be transmitted remotely.